The 27 at its proper stop, back in the day when David used to drive it. Photo by Steve Morgan. You’re standing at 3rd and Union. You want to go to 23rd and Jackson, the commercial heart of the Central District. Or you want to go home, in the dense housing near Washington Middle School. What’s the quickest way to get there? The answer is “Who knows?” And this common trip between major destinations may be Metro’s best example of bad network execution. You might walk to the Benaroya Hall bus stop, to catch route 14 or 4. Both will get you there. But the 14 runs every 20 minutes, the 4 runs every half hour, and their schedules aren’t coordinated. So it’s reasonably likely that you will have to wait 20 minutes for a bus. Or you might walk to the IGA bus stop, where route 27 stops — but only every half hour, so your wait could be even longer. When you want to go back downtown, the situation is even worse. Now you have three different bus stops you might want to use: westbound on Jackson for the 14, northbound on 23rd for the 4, or westbound on Yesler for the 27. You may have to wait 20-30 minutes at any of these bus stops, even though there are seven buses per hour between them. If you have a smartphone, and OneBusAway happens to be working, you can use it for help. But taking the bus shouldn’t require knowing three different routing options, having a smartphone, and being ready to run between stops a block or two from each other. . This situation got worse with the recent Southeast Seattle restructure, as an unintended consequence of the very welcome frequency increase on route 124 to Georgetown and Tukwila. The explanation of how that happened is a bit wonky, but the consequences aren’t: route 27, which previously picked up at the same 3rd Avenue stops as route 14 and 4, moved to different stops, even though it serves many of the same places. For routing consistency, Metro through-routed the newly frequent 124 with routes 24 and 33 to Magnolia, which share a common route all the way to the Magnolia Bridge, at most times of day. But during peak hour on weekdays, routes 24 and 33 together run much more often than route 124. So at peak hour only, Metro kept route 33 on its old through-route, with route 27. But this created something Metro saw as a problem: route 33 trips would have dropped people off at different stops downtown, depending on whether they were continuing as route 27 or route 124. Metro’s Scott Gutierrez confirmed to me by email that Metro saw the potential confusion to both riders and drivers if route 33 trips had inconsistent drop-off stops as a worse problem than having route 27 pick up at different stops from routes 4 and 14. Metro didn’t address other through-route possibilities, such as through-routing peak-hour 33 trips with route 125, or returning to the former service pattern of partially through-routing peak-hour 33 trips with route 37. I think Metro’s judgment about this was wrong. East Magnolia riders could adapt to one-block differences in their dropoff location. That is a less severe consequence than making the already confusing bus trip between downtown and the Central District even more obtuse. In the long term, this is a prime opportunity for Metro to restructure service in a way that makes it obviously better, without many negative consequences. Metro’s proposed Metro Connects network gets most of the way there, deleting the S-shaped route 4, which is sparsely ridden south of Garfield High School, and putting the service hours into much more frequent and predictable service on better-used routes 3 and 14. For trips between the area around 23rd and Jackson and downtown, route 14 would become the obvious choice. For coverage reasons, Metro proposes to leave route 27 running infrequently on Yesler, although it would stop going downtown and serve First Hill and South Lake Union instead. Riders in the south Central District will also have a frequent and very fast trip to downtown available on Link light rail starting in 2023, by walking or taking route 48 to the new Judkins Park station a half-mile to the south. In the meantime, though, Central District riders deserve better. Metro should restore route 27 to the same stops served by routes 14 and 4. All Metro downtown stops should be grouped by the neighborhood they serve. I saw a similar problem arise with the launch of RapidRide D. They put the D-line with the other RapidRide routes downtown but left the other Ballard routes where they were. That means if I want to go to Ballard I need to look at OneBusAway and decide if I want to wait at the stop that serves the 17E. 18E, and 40, or go to the stop that serves the D and 15E. All 5 of these routes should have the same stops downtown. The same cane be said for the E-line and routes 5, 26, 28. I always have the same conundrum when I’m heading to Ballard. Do I wait at 3rd and Pine or 3rd and Pike? If you don’t have OBA (or it’s messing up) it’s difficult to decide. It’s missed details like this that reflect poorly on the whole system. I often deal with this problem too, but it’s difficult to solve. All the RapidRide stops have to be together because they have different shelters with ORCA readers. All the trolleys have to be together because they can’t pass each other. Isn’t there passing trolley wire on 3rd avenue though? Is that not being used? There’s plenty of examples of people having to make choices. some not involving downtown. Take Lake City/125th which is a moderately unfriendly intersection for pedestrians. Want to go to downtown? You can wait at the SW corner for the infrequent but fast 522, or the NW corner for the frequent but slower 41. Downtown–>Lake City, either in the tunnel or on the surface. Lake City –> U District, the SW corner for the more direct 372 or the SE corner for the more frequent 65/75. UW –> Lake City, either Stevens Way for the 75/372 or Pacific for the 65. U Village –> UW, do you walk west to 25th for the 372 or south to Montlake for the 31/32/67/78? 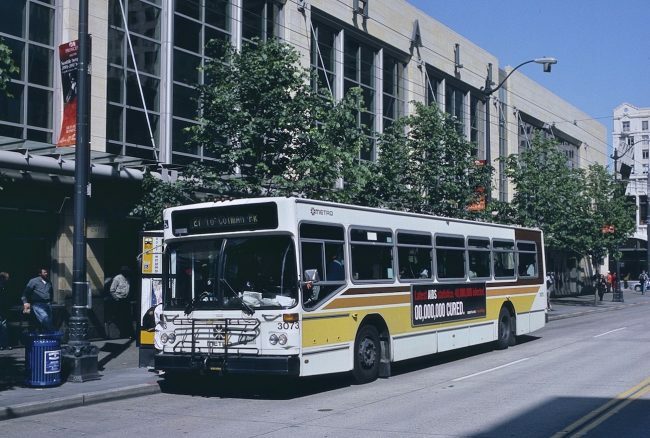 It’s a natural consequence of 2 different bus routes taking different paths to connect between the same hubs. It’s the price we pay for a comprehensive network. ‘Incomprehensible’ is a better descriptive term for Metro. More buses than necessary and not enough at the same time. More patrons left at curbside waiting for the right bus than inside the wrong buses passing. Ideal for hill climbing trolleybuses relegated to obsolete models running routes that require difficult maneuvering at more turns than necessary. To address these concerns, I drafted and submitted to City Hall “The Seattle Circulator Plan” which was subtly censored from the public. Nor did it receive a fair consideration by this and other blogs. Just the opposite. It was slammed as nonsense without the least explanation why it wouldn’t live up to its promise of conveniently frequent, intuitive and reliable transit for downtown plus dedicated thru-routes to speed regional bus lines through town. It would not be unfair to characterize Metro and Sound Transit planning as “Old School.” Metro is one of the most poorly wrought, overly-complex transit systems in the country. Woo-hoo! The paranoid graniosity is flying! The problem is that the 40 serves both Ballard and Fremont. Ballard riders want the 40 or D, while Fremont riders want the 40 or 62. Resolving this requires putting all Ballard and Fremont routes at the same stop, which is too many, especially when one of them is RapidRide and Metro wants to keep all RapidRide routes together. But at least all these routes are frequent so it’s a matter of waiting ten extra minutes at worst rather than twenty. At least with the D/40 and E/5 pairings, all of those routes are frequent, so even if you choose the wrong stop you shouldn’t face an enormously long wait. The thing that makes the 4/14/27 situation so galling is that you are choosing between multiple infrequent routes. Run Route 14 along MLK instead of 31st Ave S at 15-minute frequency. This will keep the frequent service in Judkins Park when the MLK segment of Route 8 is operated at a lower frequency. It will also keep the Judkins Park-Downtown one seat ride that used to be provided by Route 4. Run Route 27 along 31st Ave S instead of going to Lake Washington. The Lake Washington portion can be replaced by a DART route that serves all the neighborhoods along Lake Washington. When the 23rd Street entrance to Judkins Park station, CD bus options should completely change. We are just 6 years away! I would rather see any changes before this be limited. I expect many CD riders to choose routes that can get them to this station without transferring. Many riders will quit riding the slow routes into Downtown in favor of a one-station, 4 minute ride to IDS or 10 minute ride to Westlake from this new entrance. In a related observation, I think there could be merit to reorient 23rd on the lid (Judkins Park entrance to Eastlink) to even allow for bus layovers and turn-arounds. I’ll add that if Metro leaves Route 4 alone, it will stop a block away from Judkins Park Station and offer a direct bus ride from here (with a short walk) to Swedish Cherry Hill and Seattle U.
I could imagine a diesel route running from JPS to CHS along 12 from Denny to Jefferson, and with the current route 4 routing east of there. If you want to keep that formerly-useless southern connection, it would almost be better to reimagine it as a new crosstown between Judkins Park and Capitol hill stations, with Cherry Hill near the midpoint. Route 4 does not stop a block away from the future Judkins Park Station. The closest stops are 24th/Norman southbound, about four blocks away, or MLK and Judkins Park northbound, about the same distance. It will not be useful even when Judkins Park station opens. The routes that will serve the station directly are 7, 48, and 106. I’ll point out that the nearest 48 stops to the future Station entrance are still about 2 blocks away. Basic changes to the CD routes will be needed at the very least in 2023 to serve the station. I find it very hard to believe that the station design will not include stops for the 48 and/or its successors. After the ongoing disaster at UW Station, I have no problem believing Sound Transit / Metro / Seattle will be that stupid. Station design specifically calls out bus stops on Rainier and 23rd Aves, with bus stops immediately next to station entrances, so yes I have faith the 48 (and the future 23rd RR+) will stop adjacent to the station. Riders catching buses on MLK will have to walk that block to the station entrance. The current stop plan has room for just one bus only in each direction on 23rd. That doesn’t allow for any layovers of any route and doesn’t provide a places for buses to turn around. It doesn’t have room for many private employer or hospital buses and shuttles either. There are just two spots for pick-up, which could be too few to handle all of the pick-up methods that we will have in 7 years. Let’s go back to my original point about how a large part of Central Seattle would seek to get on light rail at Judkins Park rather than go Downtown on a bus that can take up to 30 minutes. We should not require anyone who is not close to 23rd to have to transfer buses to get to this station. We restructured the UW Station and CH Station routes so multiple routes would serve these places beyond what was previously there. Metro+City+ST should not replicate those messy last-minute connectivity problems that it has faced at existing Link stations outside of Downtown. Route restructuring needs to start being in discussion with the residents starting now rather than when the station is almost open. Then things like layovers and turning around buses can be added if needed. Do we need any routes to terminate or turn around at Judkins Park? It makes more sense for routes to pass through and terminate at a larger urban village like Mt Baker. When you look at downtown, Metro has been moving toward and I’ve become an even bigger proponent of, every route that touches downtown should go all the way through it to SLU or Pioneer Square or 3rd/1st Ave (proxy for the waterfront). UW Station is looking more that way too, with future Eastside routes possibly going through to Children’s or the U-District rather than turning around at the station. Shouldn’t Judkins Park be similar? As for private shuttle needs, the first question is how many shuttle vans would there be, where would they go, and how many dropoff spaces do they need? If they need to wait somewhere before pickup they can do it a few blocks from the station. Raising these questions is exactly why a restructuring discussion around this station is needed starting now. This new entrance (not there today) is a profound reduction in travel time from most of the CD into Downtown. That will affect all modes of access to the station. It’s a new and wonderful thing to offer residents and we should make it be as wonderful as possible. We do have those restructuring discussions – Metro’s long range plans (2025 and 2040) assume Judkins Park is an operating Link station. Check ’em out. And no, I don’t expect any layover space – the relevant layovers would be in Mt. Baker or Beacon hill if you’re heading South, or downtown or U District if heading North. I can’t imagine a route that would use Judkins as a termination point. One of the critiques of a station like 145th in Lynwood Link is the station is optimized for bus layover space (522 BRT) but not for buses serving the station “on the way.” Judkins is an example of good station design that optimized for buses serving the station while “on the way” on Rainier or 23rd. FYI, East Link has bus layover facilities at: MI (curb space), South Bellevue, Bellevue downtown, Overlake TC, and Redmond downtown (similar to MI, really just curb space for buses). Yes, we need to raise these questions now and discuss them. But Metro likes to keep mum until a year ahead of opening. That doesn’t mean it’s doing nothing; it just means it’s not making its early planning public. There’s a plausable reason for that. Doing it this early would lead to years of inevitable controversies and the discontents badmouthing Metro which would lead to an overall erosion of Metro’s public support, all for something that can’t happen for several years, and by the time it gets close other factors may appear that supercede what we’re thinking now. Instead what Metro has offered is a long-range plan, which is a framework of what it most wants to do as of now. Before there was no LRP so we were totally in the dark, but now there is an LRP so we at least have a fallback and starting point. When Metro does make a reorganization proposal, probably in 2022, we should be prepared with both our opinions on the LRP and our discussions of Anthony’s alternatives and any others. And an analysis of what Central District residents and workers need: where they’re going to, in what numbers, and what’s a reasonable travel time. For instance, we might say that somebody at 20th & Yesler or 17th & Jefferson wants to go to Judkins Park Station, Capitol Hill Station, and downtown. Or something like that. As I said, Metro hasn’t really articulated the Central District’s total transit goals, and nobody else has either. So that’s a good place for STB to step in and offer a recommendation or discussion. That will be good reference material when the final proposal is deliberated in 2022-2023. And when I say “STB” I mean both the staff and the commentariat together. To do the restructuring right, input from north Beacon Hill should also be sought. There isn’t a way to easily get to this station from there. You will actually be able to point at the station from Beacon Hill and say “you can’t get there from here without a bus or rail transfer”! The way I would get input would be to get a joint Metro/ST/City to create joint gaming exercises. Roll them out at not only community meetings, but also social functions, community sports gatherings, neighborhood festivals and farmer’s markets. A little discussion is really key for inspiration. First, create teams of four or five. Have them decide what are the 10 most important direct bus destinations are, knowing that the rail system would be operating in 2023 (noting the travel times between stations). Are they ready to give up a slow Downtown direct bus in favor of a route to the Judkins Park Station? Second, have these same teams design a financially-constrained system. The exercise would have a limit on the number of service hours so that higher frequencies would mean less route distance that could be planned. Some sort of service hour color-coded tracking system would be needed for different headways. Get at least 40 or 50 small-group destinations and visions, and see what kinds of common comments that emerge. When I’ve participated in exercises like this elsewhere, I’ve seen a quick consensus emerge on what would be best. Personally, I wish more of our local “professional planners” would get groups of citizens to “create” solutions (as suggested above) rather than to merely “react” to the agency recommendation only as an individual. I think that public involvement could be so much more constructive and fun if they would. It takes some willingness of some lazy professionals to open their minds to listen to new ideas, but frankly it inspires the more innovative and visionary professionals to improve on what they were already thinking! Al, you gotta look at the LRP before you criticize future hypotheticals. The LRP includes a frequent route, #1997, in the 2040 plan (but not 2025) that does exactly what you want it to do. And I’m perplexed when someone complains about lack of public engagement in Seattle. Aren’t we notorious for taking the time to get everyone’s opinion before deciding on anything? Isn’t the whole point of the LRP process to do exactly what Al is asking for? If you want something to happen, stay engaged and participate in the LRP processes when they occur. AJ, I think the essence of public engagement in Seattle is “reactive” rather than “proactive”. That’s at the core on why local public engagement gets a bad rap here. Creating environments that inspire citizens to work together “for” something rather than react “against” something would go a long way to improve engagement. Another way would be to enable settings that result in people inspiring each other, as opposed to setting up a big-public-meeting setting that ends up with the most angry and hostile among us to want to get up and speak. People that are shy aren’t stupid; they can have some really fantastic observations if given an opportunity. A smart agency would benefit if they more focus on how to engage them more than the loud people who are going to speak up anyway, and listen to the shy ones beyond just put their online comments in a document file to be ignored. I’ve got a suggestion. Over a reasonable span of time, have everyone with an idea for routing submit it to David Lawson, Martin, Frank, and rest of staff at Sound Transit Blog. Let them sort through and come up with their best judgment. Draw out of a hat can’t be worse than what we’ve got now. And publicly submit it to the King County Council. Forever silencing any complaints about transit advocates who only complain. And leaving the public with a workable plan that does not require decision from the King County Council except the ink color on the signature. Only downside is the double-bottomed dump truck full of decisions that’ll arrive every day at STB’s door. For which, in lieu of payment, the Council will agree to immediately vote for everything this blog will recommend in the future. In Seattle, actually taking a decision upon oneself earns whatever local and county equivalent is of The Congressional. Which can’t ever be posthumous because who’ll decide what kind of accident to arrange for you? Can we have the old Metro color scheme back? Who came up with the green, teal, and Blue buses (and now red and purple) with the hazard yellow and black bands. It looks so amateurish! The old scheme was so much cleaner, and the retro colors are nice too. White is ugly and makes any traces of dirt highly visible. Also I prefer high contrast colors, usually light on dark. It’s pretty rare for metro buses to look clean, even with the darker colors. Community Transit’s buses look pretty sharp, and they are white. Pierce and Sound Transit not so much. I don’t know, It doesn’t have to be that scheme, or white but it would be nice to have a good graphic designer rethink the scheme. The current scheme is haphazard, dated (especially with the teal), and as stated above looks similar to garbage trucks. I’d love to know how they decided to use teal and green together. They’re too similar. It looks like a mistake…like the teal buses are 1990’s leftovers and the green ones are the new modern version. Anyway, this is off topic so I’ll stop. Some of the buses have same color scheme as garbage (waste management) trucks, which can be a bit confusing sometimes. The current scheme brought to you by Maggie Fimia, circa 1995. I hadn’t meant to be flippant or sarcastic. I really do think that something like this can really help planners make very hard decisions. This blog is posted, and commented, by people with a very wide variety of direct transit-riding experience and the motivation to help the system improve itself. As I understand political lobbying, dispassionate determined and reliable information like this is worth many hours of e-mails and complaints. Which nothing is stopping us from delivering in addition. But the sense I get of a planner’s frame of mind is very much the way I feel about Computer Assisted Design. And driverless cars. We humans- and wolves and ducks- make design decisions much more by touch, and smell, and other physical experience than by digital information, however irreplaceable it is. Making people like us irreplaceable to transit planners. This situation is easily solvable: branch the streetcar tracks up Jackson to 23rd. Then all you’d have to do is walk 3 blocks from 3rd and Union to 1st and Pike, and off you’d go. This article is yet more proof that Metro’s transit decisions are not made by people who ride transit. I should say STILL not made by people who ride. It’s more that Metro forgets the Central District and deprioritizes it and doesn’t understand its needs very well. Ditto for STB and Seattle Subway – hence no advocacy for a Link line to run, mostly along 23rd, from Judkins Park to either UW or Capitol Hill station. I won’t use the “R” word, though. Two STB staff writers live in areas that would be served by a “Metro 8” subway; we have been longtime advocates of it; and we have written ad nauseam about the gumpy state of the CD bus network. Try again, this time with facts. What? There’ve been frequent commenters advocating here for a “Metro 8” line between Capitol Hill and Judkins Park, and lamenting the deprioritization of the RR-48. The Metro 8 line serves one part of CD trips, not the preponderance of them. And it has been described as “This would be a good line”, not how it fits into the context of where all people in the CD want to go. That context itself has not been described, so we’re operating without a starting point. That’s where-all people want to go, not where all people want to go. What is the largest cross-section of trips that people in the CD want to make. Missing the point. The point of a Metro 8 Link line is not to serve the CD, it is to serve the CD, Mount Baker, Leschi, Madrona, Denny Blaine, WP, Madison Park, Madison Valley, and Montlake – all the areas EAST of 23rd where people have been provided no reason to get out of their cars when they want to go to Capitol Hill, downtown, and eventually Seattle Center and Ballard. If there is a Metro 8 it should not go under 23rd. East of 23rd will never be densified. That means the majority of people rerouting by the subway would be making a back-track. Also, the buses run pretty freely to about 14th; it’s west of there that they need help, so that’s where the intercept should be. The valley around 14th offers some opportunities for high rise redevelopment. Yes. You captured exactly the frustration that this change has caused. I understand the reasoning but agree it’s a bad call and have been complaining about it for months. I am still dealing with the consequences of the 2016 service improvements. Almost every Metro trip I take takes more time, and in cases where a transfer is needed, is more awkward, and as is the case when I transfer at 3rd & Pine, more dangerous. Metro draws lines on maps, but fails too often to consider the human costs of their whacky decisions. Time is a precious commodity, and if Metro wasted the time of its planners as much as it wastes mine, things would be very different. The addition of a half hour to a trip because of a “service improvement” means one less hour a day I can spend doing something more productive or fun. This is why nobody I know rides Metro unless they absolutely have to. Do you live near one of the well-discussed problems like 17th & Madison (lost the 10) or 24th (lost the 43), or is there another transit hole we should know about? How does the change add up to a whole half hour every trip? How has 3rd & Pine gotten more dangerous (it has been bad for over forty years)? It’s more a question of tradeoffs. When there’s a limited about of money and the restructure is revenue-neutral (as the 2016 one was), any increase somewhere has to be matched with a decrease somewhere else. Metro issues a performance report every year listing which corridors have too little or too much service relative to their potential ridership markets, and many major corridors have been chronically underserved. San Francisco, Chicago, and Vancouver have 5-15 minute daytime and 15-20 minute evening service on lines a half-mile apart, and 30-minute night owls on lines a mile apart. Metro has been way below this, but it has now caught up days and evenings in most of the trunk corridors. That’s a major, major accomplishment. So when you look at which trips or people have gotten it worse, you also have to look at which ones have gotten it better. If those who have gotten it better are more numerous or get closer to the threshold of not needing a car, then that’s “using the county’s tax dollars more wisely and efficiently”. Obviously we can debate whether Metro has improved and how much, and whether alternatives would have been better, but it’s easier to discuss that in the context of a few specific routes than the restructure as a whole which has hundreds of variables. For instance, if you’re concerned about the 10 and 43, then you have to look at where those hours went. The 10 was shifted to John (no change in hours; John is further from parallel routes like the 11 and 12). The 43 was recycled into the 48, 8, and 49. Do the additions outweigh the subtractions? That’s a matter of debate. Capitol Hill/Madison Valley is an especially difficult problem that really has no ideal solution..All the alternatives had about an equal number of tradeoffs. The problem is the area is constrained on three sides by barriers, no bus can go straight for more than a mile without turning, and the density is arranged in a stick-shift pattern (Summit, Broadway, 15th, Pine-Madison). So Metro proposed and changed and changed and just did something, which was about all it could do. This problem would be solved if we terminated all routes at either a hub at Westlake or a hub at the Int’l District Station. I work at 18th and E Cherry and live at 1st and Bell so I deal with this situation daily. I usually take the 2 but if I miss it the 3 & 4 are backup options but those routes are notoriously slow with the stops at the courthouse and Harborview. The 11 is an option but it’s always at least 5 minutes late departing 4th and Pike in the mornings. OneBusAway is so unreliable lately it seem like every bus is showing in black so no realtime info and I want to know that there is going to be a bus showing up by the time OneBusAway shows realtime info it’s often too late to walk to the other stop to catch the alternate route. Metro has awful service between downtown and the CD and OBA is not much help since realtime data is so spotty if it is working at all. It’s pathetic! You’re a natural constituency for the Metro 8, that’s for sure! Not the bus; the mooted subway. Since the Green Line will serve Westlake and Denny, the Gates Foundation and Lower Queen Anne, the Metro 8 should cross it at Denny and terminate at Western and Battery, using the to-be-abandoned Battery Street Tunnel to get there for not much money.